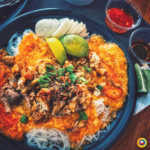 Quick and Easy Pancit Palabok Recipe: Learn how to make the thick and yellow special sauce for your palabok! Heat cooking oil in a saucepan and saute’ garlic and onion. Add the ground pork and until the pork turns brown. Add the 3 Cups of Pork Broth and the dissolved the Atsuete. Let it boil. Add a piece of shrimp cube and fish sauce then add the dissolved cornstarch. Put the noodles in a strainer and submerge in boiling water for about 2 minutes until cooked. Pour the Palabok Sauce and put the toppings.